If you thought the scrap with Hillary was dirty, you haven’t seen anything yet. From now until November, there will be no gloves, and no love. They’re putting the napkins in their shirts right now and they’re ready to have Obama for lunch. The general election is starting in earnest and after seventeen months slugging it out in the farm leagues, Barack Obama has to show he’s ready for The Show. He’s already shot himself in the foot in his selection of his Vice Presidential selection committee. Former Fannie Mae CEO Jim Johnson has hands dirty with favorable loans from subprime home loan cretins, Countrywide Home Loans; and former Clinton Deputy Attorney General Eric Holder urged the former President to pardon fugitive financier Mark Rich. That’s not change you can believe in, but it is a discussion for another day. Ah yes, God bless paranoid America. They’re still out there, and they’re still amenable to this kind of conspiratorial blather. This artful slur started making its rounds some months ago, about the same time as and aided by the put-the-dots-together reminder that his middle name was Hussein. I don’t want to disparage my West Virginia and Kentucky brothers and sisters, but given the preliminary and exit poll interviews, and the signs at some Hillary rallies, I don’t think I’m risking a lawsuit suggesting that Obama got clobbered so badly in both states because many people knew someone who knew someone who had a computer who got the email that Barack Hussein Obama was educated at a madrasah when he grew up in Indonesia. Where they taught him to fly but not land 737s. This is going to be a nasty campaign and it probably is a good thing that Reverend Wright, the “bitter” flap, William Ayers, and the Muslim nonsense came out in the primary, because they’re all going to come out again in the fall. The Internuts are already online with, among other sites, exposeobama.com. The photo array on the top of the page shows Obama with Reverend Wright, Obama with Ted Kennedy, Al Sharpton, Louis Farrakhan, and…Obama coming out of the surf in Hawaii shirtless??? C’mon. It’s not like he’s got Man-maries or something. He looks better shirtless than most men his age. It’s not John Kerry windsurfing, and it’s not Michael Dukakis in the tank. I really don’t get it. A picture of a shirtless black man–maybe it’s a “me doth protest too much” latent homosexual expression, but they’re not talking, so I can only be left with my conjecture. Don’t turn away at this, though. If you do, you’ll miss the story of Michelle Obama’s “Kill Whitey” thesis when she was at Princeton in 1985. The text is creatively edited and context is left in a pile on the desk with the discarded paperclips. They also note with race-baiting subtlety that “it was written under her maiden name, Michelle LaVaughn Robinson”, as if her parents chose her name from an Afro-American Studies class taught by Malcolm X’s little brother, Trent. 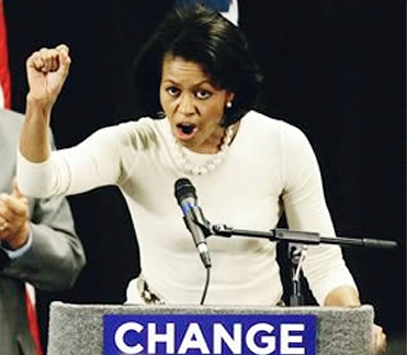 I have to give them extra points for running the story under a photo of a contemporary Michelle at the lectern raising a fist Black Panther-style, again with the context disposed of as an inconvenience. Save the Aryan pride, though. Anyone who saw the alabaster John McCain against the key lime backdrop last week has to concede that White isn’t always Right.